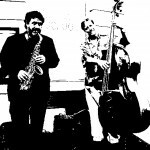 Hayes and Dean have been playing together since the 1970s and collectively have played with the Who’s Who of modern jazz today. They play tunes and freely improvise–all in the pursuit of creating beauty and art while taking audiences on a heartfelt journey from bebop to beyond and everything in between. Check out Hayes Greenfield and Dean Johnson, then join us at the Inkwell Cafe, 408 Rogers Ave (betw Sterling St & Lefferts Ave) for great music, food and drinks! $5 suggested donation supports the performers and PLG Arts.